Living in the backwoods means fixing a lot of broken-down machinery! David was on his way home a couple of nights ago when his heater all of a sudden began blowing cold air. Oh oh. Not good. He pulled over to the side of the road and looked under the hood. The heater hose had ruptured and antifreeze was spraying out of the split. 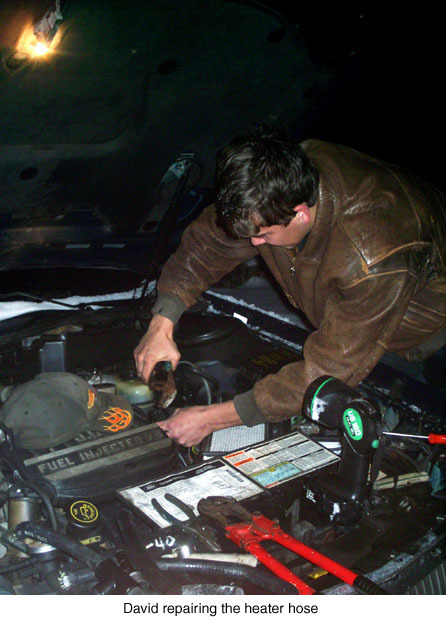 He managed to limp the car home, then splice in a pvc elbow, held in place by pipe clamps. It’s never nice working on a vehicle outside, in the dark, in a Minnesota winter. Wouldn’t a garage or shop be nice? But I stayed out with him, held a flashlight and helped hunt for parts. Finally, it got done and he put the whole area back together (air cleaner, etc.). Unfortunately, he had used up all our antifreeze and he’ll have to pick up a couple of jugs in town tomorrow. He’ll have to stop at the Ford garage and have them look at the hose, as the temporary repair will only buy a little time; it won’t be safe to leave in place as pvc isn’t meant for that high a temperature. We don’t want it to fail when a storm’s blowing or in some out of the way place. Machines!!! They try to keep you broke and crazy! My donkeys are looking better and better. Seriously, I’m glad that David is learning how to get a few things fixed; it’s a valuable life skill, depending on yourself and figuring what you can do to get back going again. A lot of 17 year olds just watch TV, play video games and expect someone else to fix all their problems. In the real world, one often has to depend on themself to get out of a fix, and the more practice you have the easier it is to figure out what to do. How about when they leave home? I hope this is not too personal of a question but it is one that I am facing and could use some help on planning for the future. I know that David is in highschool and the time that he will be leaving home is only a few years away. What sorts of preparations are you making now for that time when all the work etc. is on your shoulders? My children are in high school and my husband is handicapped and does very little of the farm work. We are not as rural as you are but still I need to be able to handle all the work when they leave. I do not want to leave the farm because it is what I have worked so hard for. What tools, situations, do I need to be getting in order now? Of course you don’t want to leave the farm! And there’s no reason to consider it unless it is what you actually want. What I am doing is working toward having everything fairly up-to-date (i.e. breakdown resistant! ), convenient buildings and fences built and ways to do things that don’t require tons of strength. For instance, we have a four wheeler with a garden trailer so I can clean pens and spread the manure on the garden or dump it on the compost pile. Yes, I wheelbarrowed it for years, but this is much easier. Perhaps you might want to consider raised garden beds to eliminate the tilling, bending and kneeling. I’m working toward a low-till system in my own garden. Because it’s new, I still have to till it, but am planting raspberries, blueberries, black raspberries and currants that are mulched instead of tilled. And when the garden gets in shape (soil fertility, weeds under control) I’ll be mulching heavily there too so that when my back gets worse I won’t have to till so much. I’m keeping my poultry and goat population to something I can manage. I don’t feel that I could milk fifty does anymore. Or twenty. I have two milkers now, and that’s plenty, not only to milk but to feed and care for the babies. I also have our old whether, Oreo, and a buck. It’s enough. Likewise, we only have fifteen chickens, yeararound and four turkeys. Too many and it gets like work and you don’t enjoy chores any more. One homestead help I love is our old moving dolly. It’s the two-wheeled kind and I can haul hundred pound bags of feed around, bales of hay, spaghnum moss, rocks, cement blocks and even railroad ties. Another help is a five gallon bucket! I struggle holding a 100-pound sack on the edge of the garbage can feed container. So sometimes I’ll pour out some of the grain into a five gallon bucket, dump that into the can and repeat it until it gets a lot lighter. Okay. So I’m a wuss! I absolutely loved the golf cart my son brought up for Mom to use in the summer. It was battery powered electric. Not only did she get lots of rides, but I used it for chores and garden work. It was quiet, hauled lots of stuff for me and was easy to get into and out of, unlike the four-wheeler. Sometimes you will just have to hire some work done. You’ll be lucky if you look around, and find a nice teenager or out-of-work or underworked person looking for a little extra cash. I’ve hired Tom, our carpenter friend, to not only do a lot of the building I’m not smart or strong enough to handle, but also to help around the place on different projects. In the plans for the near future are a hay/machine shed, a garage for fixing breakdowns in the winter, heated by a wood stove, more pastures, a fence around the whole garden/house area to keep the deer out and another small horse shelter. By doing these while I have David to help, I’ll have the use of them when he’s grown and walking his own trail. Every day I plan for the future and think about how to make things easier, quicker and safer. Next spring we’re adding more enclosed porch around the East side of the house. Now I do my laundry in the basement. But my knees are not good and I’ve decided to move the laundry up into the north end of the new entry porch so if they get worse I can skip doing the basement steps fifteen times a night. observe and can’t ask questions. Oh yes and then my cat got into a fight and the wound festered and so a treatment of anti-biotics was needed and seemed all was healing well and then the infection came back. I gave the cat 3 small tablets (they dissolve immediately in the mouth and taste like sugar so no fights) and the next day the yellow puss was gone and the wound appeared to be healing and now it is just a tiny dot of a spot. WOW! This is a learning experience for me. With animals you don’t have the placebo effect so what you see is what you get, and I got two happy animals. I didn’t know what to do and you got me thinking arthritis so I knew that this was my last shot. Thanks. Her knees are also not swollen. If the symptoms come back I just simply re-dose once and watch. Can it be that simple, only time will tell.